Mini light bars are very cost effective way to provide 360 degree light for your caution or emergency needs! 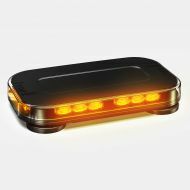 The Fusion Mini Light Bar is an industry leader with its dual mode capability, functioning as both a warning light and scene light. With 360° degree lighting and 25 to 75 flash patterns, the mini LED light bar offers extreme warning light power. The 30" is our largest magnet mount roof light! ****This product, along with all our products contain 3 Watt diodes (not 1 watt diodes)!! This is our smallest mini light bar! Its 14" long and has 6 heavy duty magnets but can easily be permanently mounted. ****This product, along with all our products contain 3 Watt diodes (not 1 watt diodes)! !